Do you remember being a kid and trying to find all the other words one word could make? I do, it I always loved the fun seasonal worksheets we would do at school or home. It was exciting to try and see if I could find all the words my friends found. Here is a Free printable worksheets for homeschool or classroom use during the winter months. Printable word worksheet. 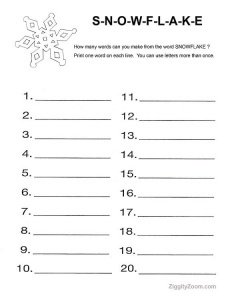 See how many words the kids can make from using the word Snowflake.